We finished the mountain top piece just after we installed the ligthouse on Friday. 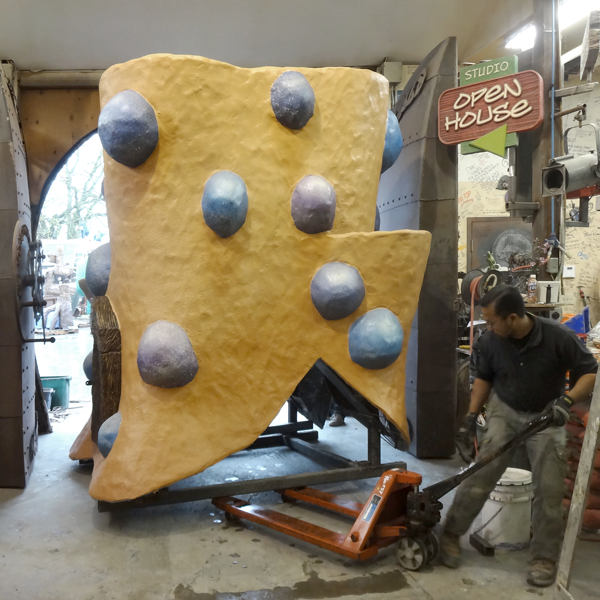 The mountain top was the biggest and heaviest piece we ever finished inside the shop. I knew it would be a big challenge to move. We hooked up the tractor to give it a tug and sure enough it wouldn't budge. It was time for plan 'B'. We jacked up the rear of the feature and slid a pallet jack underneath. Our reasoning was that the wheels on the back of the massive piece would cut the drag resistance by half. But it also raised the piece enough to make it a very tight fit through the door. Brando steered the pallet jack at the rear while I would do my best to guide it up front. Hailey and Sarah were spotters on both sides to make sure we cleared the doorway and I began to pull once more. Slowly we eased it out of the shop with fractions of an inch of clearance on both sides. I love it when a plan comes together!